One of my favorite food memories is that of eating fresh crêpes in Paris. It was fun watching the street vendors making crêpes – pouring the batter on the hot pan and then deftly spreading the batter evenly and thinly with a wooden spreader. The scent of the crêpe as it cooked was intoxicating. They would then add your filling of choice, fold the crêpe into quarters, wrap it in paper and hand it to you while it was still warm. I still remember the feeling of total enjoyment after I took the first bite of that perfectly thin crêpe. Whenever someone mentions Paris, my first thought is not of the Eiffel Tower but of warm crêpes oozing with chocolate hazelnut spread (always my preferred filling). Some good friends of ours just returned from Paris, so of course, I was craving crêpes. The tricky thing about crêpes is getting something that is thin and delicate yet just sturdy enough so it does not fall apart when you are trying to flip it. After trying several recipes over the years, I finally settled on this one. It uses butter and vanilla which not only adds to the taste and texture, it also makes the crêpes smell wonderful. Cooking a crêpe does require a little finesse and patience at first. The first few you make may not be the prettiest but they will still taste good. Once you get the heat right and get the feeling of how to rotate the pan to evenly spread the batter, you will feel like an old pro. Imagine how happy my kids were this morning when they woke up to sweet crêpes for breakfast. I often make these for breakfast after a slumber party and they are always a crowd pleaser. I just double or triple the recipe as needed. Since they keep so well in the freezer, I never mind having extras. Imagine how happy you will be if you whip up a batch for breakfast tomorrow. If you make the batter before going to bed, you can let it rest overnight in the refrigerator and be ready to go in the morning. In a blender, place the eggs, milk, water, flour, butter, sugar, and vanilla extract and blend until smooth. 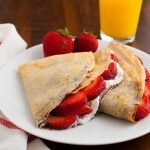 Rest the crêpe batter in the refrigerator, covered, for at least 1 hour and up to 1 day. Over medium heat, melt 1 teaspoon butter in a 9-inch crêpe pan or non-stick fry pan. Use a pastry brush to coat the pan evenly. Fill a 1/3 measuring cup with batter to just below the lip. Pour the batter into pan then tilt and rotate the pan until the batter is spread evenly over the bottom of the pan. Do this quickly as the batter will start to cook as soon as it touches the hot pan. Cook until the edges just begin to curl up and start to brown and the batter looks set, 1 minute. Use a small thin spatula to lift the edge of the crêpe, then carefully grasp the edge with your fingertips and slide the spatula under the crepe. Then quickly flip the crêpe over in the pan. Cook until the second side is slightly browned and set, about 30 seconds more. Transfer to a plate and cover with a clean dish towel to keep warm. Repeat with remaining batter. To serve, spread Nutella over half the crêpe, then spread some sweetened whipped cream on top of the Nutella. Top 1/4 of the whipped cream with slice strawberries. Fold the crêpe into quarters and enjoy. To store uneaten crepes, stack the crepes between squares of wax or parchment paper then place in a re-sealable plastic bag. Crepes can be stored in the refrigerator for a few days or stored in the freezer for 2 months. Thaw overnight in the refrigerator before using. Recipe adapted from Alton Brown.